The full story of the Duigan Brother's design, construction and subsequent flights of Australia's first locally built aircraft, illustrated with rare photos from the Duigan Family Archive, is provided on following pages in the form of a lecture given in 1962 by Terry Duigan, son of Reginald, and nephew of John. 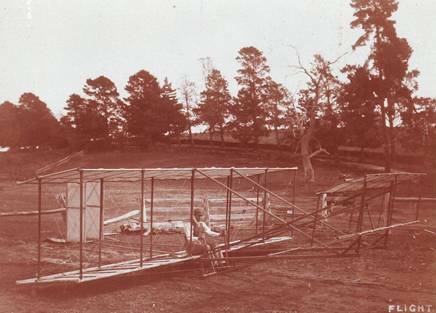 The Duigan Aeroplane was designed and constructed by John Robertson Duigan with the assistance of his younger brother, Reginald Charles Duigan on their parent’s property, ‘Spring Plains’at Mia Mia Victoria. After many trials, the first flight was achieved by John on 16th July, 1910, thus making this event to be the first flight of an Australian aeroplane.Later in the year, on 7 th October, a flight under full control of 196 yards, at 25 mph at a height of 12 feet, was achieved before half a dozen spectators. No official records were recorded. The plane was flown officially at Bendigo racecourse on 11th May, 1911, before 600 spectators, approximately. 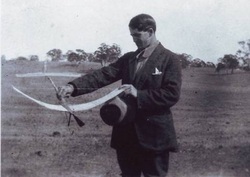 On 31 st May a demonstration was given at Spring Plains before Major Hedges of the Defence Department and Mr F. W. Marshall of the Aerial League of Australia, Victorian Branch. On September, 1909, the Federal Government offered a prize of 5,000 sterling, for a successful flying machine….for military purposes. John Duigan did not put in an entry, until after the closing date, because he had misunderstood the definition of the word ‘poising.’ This, he found out too late, was a cavalry term used to describe a half circle. The prize was never awarded. An edited transcript follows on the following pages, of the 7th Lawrence Hargrave Oration, ‘The First Australian – Made Aeroplane 1910,’ delivered to the Royal Aeronautical Society, Melbourne Branch, on 21st June, 1962 , by Terence Duigan, son of Reginald, giving a detailed description of the events leading up to, and the building of the Duigan aero plane. Terence was the second son of Reginald Duigan, himself an aviator of some repute in the Second World War and an architect in civil life. His notes were prepared with the full guidance of his father, who was present at the oration in 1962. I am going to talk you about the first Australian aeroplane. It was designed by my uncle, John Duigan and built by him and flown by him between 1909 and 1911. With some assistance in both departments, by my father Reginald Duigan. I imagine most of the present day interest in this episode, in my uncle’s and my father’s life comes under two headings. First naturally enough what did they do and how did they do it and second how much of this was original work? In order to answer the second question while dealing with the first, I have prepared a beautiful summary of the history of aviation starting with the pterodactyl and finishing with Uncle Jack, and tracing the evolution of all the components of an aeroplane. Unfortunately, the running time of this is about two hours, so either your dinner, uncle’s plane or my history will have to go. I thought of asking for a show of hands but I don’t think I’ll bother. The three clues to aviation are almost as old as human history as the wheel, the kite for lift, the windmill [in reverse] for propulsion and the arrow, or rather the tail of the arrow for control. In the early eighteen hundreds, I am starting eighteen hundred, forgetting the pterodactyl, the most powerful and original mind to work on aviation before practical flight was achieved, related all three and, correctly, forecast the modern airplane. At the age of twenty-seven, Sir George Caley formulated the basic concept of mechanical flight; the wing and equilibrium under the forces of lift, thrust and drag. He went onto the creation of models that had all the necessary components, except ailerons, and towards the end of his life, produced successful man gliders that flew at the end of tow ropes. He used a rotating arm to compare various wing profiles, angles of attack, and aspect ratios and investigated the positions of movements of centres of pressure. He understood the action of the cambered wing in relation to lift, dihedral in relation to lateral stability. If his interest had not been so manifold, or if he had been more of a fanatic he would probably have achieved a practical aeroplane. His scientific standing made respectable, a field until then reserved for crackpots. After Cayley, and to some extent contemporary with him, came Henson, Stringfellow, Le Bris and Du Temple, their main contributions being to keep the flag flying. In 1866, your ancestor, The Aeronautical Society of Great Britain, was born and aviation became a fit associate for scientists. Wenam’s work with a wind tunnel was the first publication of note by the Society. In 1868, Stringfellow, at an exhibition given by the Society, harking back to Caley’s evaluation of the Henson Aerial Carriage of twenty years before, produced a model with braced biplane wings, and this lasted until the 1930’s as the most practical form of lifting device. The Otto engine which changed, and is still changing the world, appeared in 1876; and between 1870 and 1890, Penaud first independently reaffirmed much of Cayley’s work, and then on discovering his work, revived interest in him and re - established him in the minds of inventors - Lillienthal in Germany, Ader in France, Chanute and Langley in America and the man whom this talk commemorates, Hargrave in Australia. Of these Lilienthal and Pilcher were the key figures. By getting into the air on gliders, they raised the previously unformulated problems of dynamic control. Their deaths in crashes sign posted the hard road ahead. Chanute, an engineer of the same mind, but lacking the practical service, combined his knowledge of the Pratt truss with Stringfellow’s bi plane configuration to hand on the lifting part of the airplane complete and ready for use. Now we come to the end of the 19th century. In all Europe and the USA, perhaps, a dozen men, in all possession of their faculties, were engaged in flying research. None of these were in sight of practical flight. The two who got an inkling of the control problems involved, were dead. Ten years later in far off Mia Mia, John Duigan was flying a machine that was an aircraft in every sense of the word. Were all the problems then largely unformulated, solved and tidily written up in text books ready and available in Australia, in 1908, when he started to take an interest in flight, so that all he needed for success was a little ingenuity and a good deal of sweat? The answer to the last question is clearly: No. I have read a fair bit of what was written on aviation at the time, and it reveals a state of affairs usual in the early stages of a new vogue. Popular demand for information was filled by journalists with only the sketchiest of connections with the workers in the field of the pioneers, most of whom, were going bull headed at their problems. And the writings of the few, who did address the public, reveal a greater state of confusion than their results would indicate - because aviation at the beginning, was the kind of activity leading to trial - and error getting a long way ahead of theory. And were the basic problems of mechanical flight solved? A reasonable answer is - at the time Uncle Jack started – NO. By the time he had finished - YES. But a long time was to lapse before information was systematically recorded and freely available. These are probably not the generally accepted answers, so I will give you the bones of the argument as quickly as possible. In 1899 the Wright brothers set themselves the goal of human flight. They succeeded because they were, themselves, calm, methodical and brave, infinitely painstaking and of the stuff of which the best pilots are made. With these attributes they were able to force into practical flight, a machine that was basically unsound and yet in their hands so successful that it was a stumbling block for all contemporary designers. By a singular lapse in logic, that their subsequent writing makes even more inexplicable, they took the wrong turning at the start. However their highly unstable design forced them into evolving and mastering, effective controls on all three axes, and initial interconnection of wing warping and rudder, for ease of operation, led them to the banked turn. By 1905 they were satisfied with their design and set about making it pay. They gave up flying [until 1908] and put in train numerous applications. In Europe, aviation research at the turn of the century was moribund. In 1903 Chanute’s visit and account of the Wright Bros’ work, produced an explosion of slapdash activity from a little band of enthusiasts, Ferber, Archdeacon, Santos, Dumont, Esnault – Peltrie, Levavasseur, Bleriot, Voisin, Delagrange, and later, Farman. They produced a number of incompletely realized copies of the Wright machine, which fortunately were all unsuccessful, and then returned to the inherently stable, but equally unsuccessful, designs of all shapes and sizes. From this point they proceeded painfully to evolve the real airplane, both stable and controllable about all three axes. 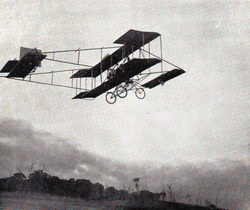 By the middle of 1908, the Farman version of the Voisin was nearly an aircraft and after Wilbur Wright started flying in France, his technique, and the European type of machine gradually coalesced into the true aeroplane. For all that, according to the Gorrell Committee, the first flight in England by an English man was in mid 1909 on an imported Voisin and the first practical English machine which flew at the end of 1909 was a Wright, built by the Short Brothers. Aircraft continued to appear until the end of 1911, with one or other of the main controls missing. Now we have reached my Uncle’s time in fact we have gone ahead of it. John Duigan’s active interest in flight started towards the end of 1908 and the position at the time was, that there were about half a dozen moderately successful aeroplanes in the world. The reasons for their success were by no means clearly understood and the essentials were not recognized, as such, in the welter of uncritical speculation. Of the previous century’s record of aviation research, Uncle Jack had hardly an inkling. In fact the whole question of flight bulked curiously small in the public mind. We still have copied of Chums, and the Boys Own Annual from about this time, [Uncle Jack was into rather heavier stuff by then] and they barely mentioned flying. The only illustrations occur in jokes and show things that were a cross between balloons and airplanes. That was 1908, 09, 10. This last misconception may be the real reason why the Wrights made so little stir with their early American flights. It seems to have been common knowledge around Dayton, that a machine was flying daily and under the popular assumption that they were experimenting with a version of the common dirigible, can explain local neglect. Uncle Jack left Brighton Grammar in 1900 and went to Finsbury Technical School in London. He was there for 4 years and took diplomas in both electrical and motor engineering, and then he had about 3 years experience with several firms including Weymouths and Seimens. Apart, altogether, from questions of personality, it can be seen that he was in many ways better equipped than most of the recognized pioneers in aviation. The disciplines of electrical engineering were established in his day, and to my mind, the mathematics of say, multi - phase generation, transmission, and absorption of electrical energy, are at least as difficult to grasp, as are those of aerodynamic equilibrium. At any rate, he was accustomed to the ordinary arithmetic of kinematics, and although like most people, he probably passed exams and promptly forgot a good deal, he would be well ahead of scratch in considering things like the conversion of horsepower into thrust and equating it to lift and drag, and so on, and at the same time being on speaking terms, as it were, with methods of this kind, he would be unlikely to be blinded by some of the specious and incorrect mathematics that were being applied to aviation at this time. He returned to Australia early in 1908. At that time grandfather Duigan owned Spring Plains, a property that would be about 10,000 acres between Kyneton and Heathcote and father was managing it for the family. Uncle Jack was at a loose end, so he went there to help until he found a suitable outlet for his training. He had no interest at all in the land and the machinery that was likely to need his attention, was limited in both amount and complexity. As far as father remembers his brother had no contact with aviation in any shape or size while training in England and showed no special interest in it on his return to Australia. On the other hand he liked making things. Things with a mechanical bias. For instance, as a boy, he made an enormous kite which showed it’s lifting power by whipping Father [a child of 8 or so] up to 10 feet before, he could decide to let go. Another production when the family was living at Brighton, was a steam-powered canoe, which exploded and broke down when far out at sea. When Uncle Jack had been back about six months, Wilbur Wright began flying in France. A fellow student from Finsbury, Stanley Featherstone, more or less casually included a picture of the Wright brothers’ machine and an account of their early doings in a letter sent to Uncle. There didn’t seem to be much in making such a glider, so uncle with time on his hands, decided to have a shot at it. There are plenty of little hills and valleys around Spring Plains; in fact it is about 90% that, but the hills that weren’t timbered at the time, were lined with little boulders, so the intention was to fly the glider in the wind like a kite. It didn’t take long to build. The only photo we could find was too faded for reproduction, but still showed most of the detail. It was like the first Wright, but a bit smaller, a braced biplane with single surfaced planes covered only on the top of the frames, at least that is what it looks like. I would have expected the cloth to be on the underside. Uncle had evidently, not yet got to grips with the problem, because it had neither lateral nor directional controls. On the other hand, what it had, a Wright type elevator controlled by a pole, would be all that a kite flyer would think to provide, and indicated that so far he had not read anything written by the Wright Bros or anyone else to make him think differently.